It’s difficult to say what caused M. Night Shyamalan to lose his groove. His two first movies — The Sixth Sense and Unbreakable — were major hits, solidifying him as a must-watch director. Though his next two releases were flawed, Signs and The Village still had some value. Then in 2006, he released a movie that was meant to be a bedtime story — a brand new tale of love, analogy, and monsters. This movie was Lady in the Water, and instead of being the next big thing, it made the rising hotshot director into a joke. Instead of deep and creative, Lady in the Water comes off as petty and self-absorbed. Lady in the Water is a complicated story, with a lot to take in. To his credit, M. Night Shyamalan tried to do something new. He didn’t rely on existing source material, and used common creatures from various folklore. Cleveland Heep (played by Paul Giamatti) is a superintendent who discovers a ‘narf’ named Story (played by Bryce Dallas Howard) in his apartment complex’s pool. This pseudo-water nymph is on a quest to find The Author, an artist who will bring forth great changes to the world. The Author’s work, this story (the symbolism just oozes off the screen) will influence the best of minds and bring on world peace or some kind of great change. Before she can return to her own world, however, she is attacked by a scrunt, a wolf-like hunter that is also part plant. The only way to save herself from the creature is to recruit a team of experts to conduct a ritual to grant her safe passage to her home. She’s looking for a Symbolist, a Guardian, a Guild, and a Healer. It turns out that the quirky and kindhearted residents of the apartment complex might be the ones she’s looking for. Story is soft spoken and communicates in idioms or prophecies most of the time. Like the majority of Shyamlan’s films that include twists, the possibility that Story is either a real narf or simply a troubled girl is initially shrouded in mystery. That concept is quickly put aside, however, and the supernatural elements are proven real. This is a good change for Shyamalan’s typical tales, as audiences back then were usually expecting some kind of twist in his movies. With a little bit of hesitation, the residents don’t fully dispute the existence of the supernatural, but holding them back instead is their inability to accept that they somehow hold an important role in the story. Lady in the Water had the potential to be a good tale about about one’s own importance, and pride, as just because someone may not have a role in the grandeur schemes doesn’t mean they don’t hold a different — and possibly more important — role somewhere else. Aside from the weird story and the ridiculous names, Lady in the Water has two major problems: Vic Ran, and Harry Farber. Vic Ran is an up-and-coming author (played by M. Night Shyamalan himself). He is writing something called The Cookbook, a manuscript without much substance that contains a series of views and ideas. The problem is that he’s reserved and insecure about his own work; he’s not ready for it to be shared with the public. Yet with the help from Story, a strange women he just met, his opus will supposedly be inspirational and prophetic. It’s not uncommon for a director to put himself in his movie; Tarantino does it all the time. The biggest difference is that Shyamalan made himself the savior of the story, the one person who will bring hope and joy to everyone in the world. ‘Story’ is telling the ‘Author’ that he is incredibly special. This obvious metaphor comes off as pretentious and self-absorbed, giving the impression that Shyamalan’s own writing is something of immense value to the world. There’s no subtly, and the message comes off more cheesy then important. If Lady in the Water cast someone else in the role, and made their work to be important to a smaller audience, then maybe he could have gotten away with it. 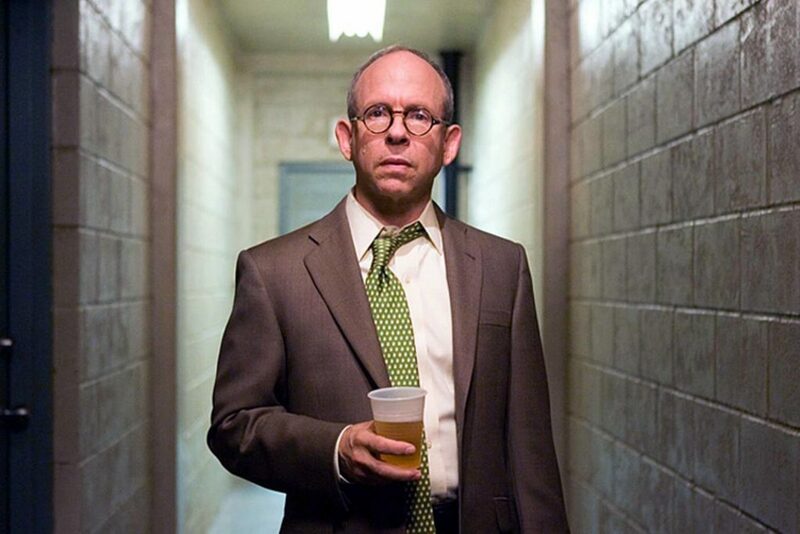 The other major problem is Harry Farber, played by Bob Balaban. He is a film critic, and he doesn’t get any kind of respect. It seems that this character was created as a strawman for critics in general who didn’t like Shyamalan’s previous movies. Harry is a snobby, weak-willed loser — selfish and callous, without any redeeming factors. This blatant symbolism is simply tactless, lazy screenwriting. Good critics back up their points and do their best to show the value in a piece of art, sometimes calling a movie bad because the movie is actually bad. Accusing the critic of being too critical when they have a point is poor sportsmanship. Lady in the Water could have used the critic as a better source for pride and worth, making the point that one person’s opinion is not the end of the world. In this rendition, however, his appearance comes off in poor taste. Lady in the Water tries too hard to tell a bedtime story about overcoming fears and finding ones true paradise, and its metaphors come off far too cruel and direct. Shyamalan could have made Lady in the Water into something sweet and prolific, but he went too heavy handed with unironic self-gratification. That the movie wasn’t a critical or financial success adds insult to injury, showing that not all critics are monsters, and not all artists are visionaries. But one bad movie does not set an artist’s future in stone. His recent movies — like Split and the upcoming Glass — suggest that he may still have a good story to tell.